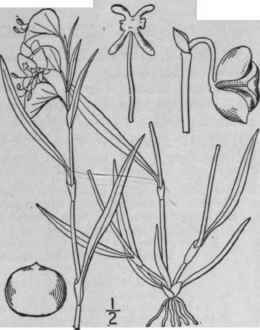 Commelina communis L. Sp. PI. 40. 1753-Commelina Willdenovii Kunth, Enum. 4: 37. 1843. Glabrous or nearly so, stems ascending or decumbent, rather slender, sometimes rooting at the nodes, 1°-3° long. 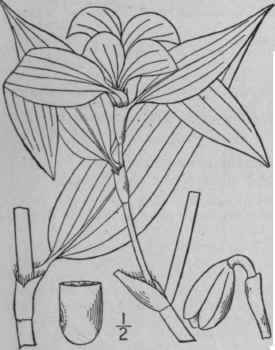 Leaves lanceolate or oblong-lanceolate, 3-5' long, 1'-l 1/2' wide, acuminate at the apex, narrowed or rounded at the base, smooth; sheath white-membranous with green veins, sometimes ciliate, 8"-12" long; spathes few, peduncled, their 2 bracts acute or acuminate, nearly 1' long, glabrous or sometimes pubescent, distinct; flowers deep blue, 1/2 or more broad; ventral cells of the ovary 2-ovuled, the dorsal 1-ovuled; capsule 2-celled, each cell 2-seeded; seeds compressed, dark brown, roughened. Southern New York to Pennsylvania, Georgia and Kentucky, and reported from farther north. Adventive or naturalized from Asia. July-Oct.
Commelina crispa Wooton, Bull. Torr. Club 25: 451. 1898. 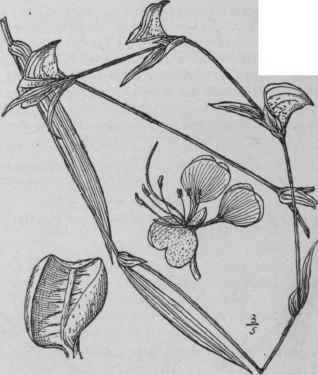 Finely villous or glabrous below; stems commonly branched at the base, the branches 1/2°-3° long. Leaves lanceolate or linear-lanceolate, 1 1/4-3 1/4 long, acuminate, crisped, slightly contracted at the base; sheaths pale, 6"-7 1/2" long, ciliate; spathes 3/4'-l' long, acute or acuminate, pubescent, united at the base; sepals orbicular-elliptic; petals various, the 2 upper light blue, with slender claws and broadly reniform blades, 5"-7" broad, the third white, lanceolate, 1"-1 1/2" long; capsule 2"-21/2" long, 3-celled, 2 cavities dehiscent, third cavity in-dehiscent; seeds smooth. In sandy and rocky soil, Missouri and Nebraska to Texas and New Mexico. July-Sept.
Commelina virginica L. Sp. PI. Ed. 2, 61. 1762. 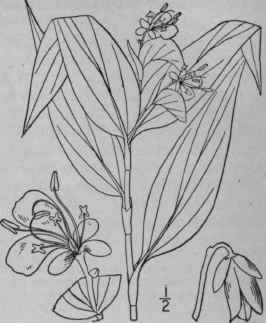 Similar to Commelina communis, somewhat pubescent or glabrous, the stems diffusely branched, rather stouter, 1 1/2°-3° high. Leaves lanceolate or linear-lanceolate, 3'-5' long, 5"-12" wide, acuminate at the apex; sheaths inflated, often pubescent, the orifice sometimes fringed; spathes several, usually peduncled, the 2 bracts acute or acuminate, 8"-12" long, distinct; flowers 1' broad or less, showy; capsule 3-celled, each cell i-seeded, the dorsal one in-dehiscent and roughened. In moist soil, southern New York to Illinois and Michigan, south to Florida, Kansas, Texas and through tropical America to Paraguay. June-Sept. Somewhat pubescent or glabrous, the stems commonly tufted, erect or ascending, 1°-2° tall, the roots somewhat thickened. Leaves linear-lanceolate, 3'-6' long, 4"-1' wide, acuminate at the apex, narrowed at the base; sheaths 1/2'-1' long, often pubescent; spathes peduncled or sessile, the 2 bracts more or less pubescent, acute or acuminate, distinct, 10"-20" long; flowers 1/2' or more broad; ovary 3-celled, each cell 1-ovuled; capsule papery, all its cells dehiscent, each 1-seeded; seeds ash-colored, nearly or quite smooth, puberulent. In moist soil, southern Pennsylvania to Florida, Texas and in tropical America. Aug.-Oct.
Commelina longifolia Michx. Fl. Bor. Am. 1: 23. 1803. Not Lam. 1791. 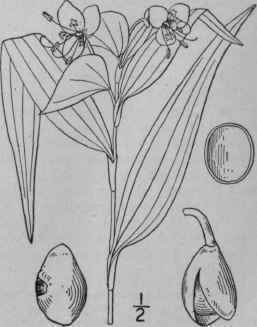 'Commelina hirtella Vahl. Enum. 2: 166. 1806. C. erecta A. Gray, Man. Ed. 2, 486. 1856. Not L. 1753. Stems stout, erect or ascending, 2°-4° high. Leaves lanceolate, acuminate, roughish, 4'-7' long, 1'- 11 /2' wide, their sheaths 1/2-1' long, fringed with long brownish hairs and sometimes pubescent; spathes sessile or short-peduncled, often clustered at the summits of the stem and branches, the 2 bracts acute, united by their margins, rather strongly cross-veined; ventral cells of the ovary 2-ovuled, the other i-ovuled; capsule 5-seeded; seeds ellipsoid, brown, somewhat more than 1" long, smooth, minutely puberulent. In moist soil, southern New Jersey to Missouri, south to Florida and Texas. Aug.-Oct.